How many casualties so far? So just how many 18-20 year old Libyan soldiers has Obama killed? Or were those tanks, trucks and command centers just empty? Dropping bombs on 18-20 year old Libyan solders, killing them without warning and without a declaration of war is a crime. When our soldiers die in combat, we cringe. Yet when we see young Libyan soldiers die, at our hand, some cheer. CNN even cheered when a rebel suicide bomber drove a truck loaded with explosives into a Libyan army barracks and detonated it, killing hundreds. Libyan soldiers were under the impression that they were protecting their homeland against an internal assault by government protesters in conjunction with foreign terrorists. Libya never declared war on the United States, and no U.S. interests were at risk, so how can this action be justified? Firing missiles, from miles away, at young Libyan soldiers, who were defending themselves against an internal uprising, killing untold thousands, without authorization, and without a formal declaration of war, is not only cowardly, but in my mind constitutes a war crime punishable by impeachment, if not death. Operation Odyssey Dawn is an unauthorized use of military force. There was no formal declaration of war. There is no specific statutory authorization. There was not a national emergency created by an attack upon the United States, its territories or possessions, or its armed forces. Whether you agree with the war in Iraq or not, the use of military force was authorized by Congress – AUTHORIZATION FOR USE OF MILITARY FORCE AGAINST IRAQ RESOLUTION OF 2002. No matter what justification you may wish to apply to this action, taken solely by the order of Barack Obama, it is a blatant abuse of power for which he should pay the ultimate price. How dare you even mention the words, “the American people”. 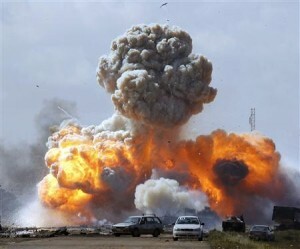 Neither the American people, nor their representatives have authorized any such involvement in Libya. Obama has murdered thousands of Libyan soldiers on the ground, without authorization from the American people, thus setting us all up for retaliation, by God knows who, at some future date. When it’s all over, and the number of Libyan casualties have been tallied, somebody needs to be held to account by the International Criminal Court (ICC).